Despite refusal of haredi MKs to join coalition for vote, bill making it easier for courts to condemn terrorists to death passes first vote. A bill which would make it easier for both civilian and military courts to sentence terrorists found guilty of murder to death passed its preliminary reading in the Knesset Wednesday, winning a narrow plurality of 52 to 49 in the 120 member legislature. The United Torah Judaism party, however, abstained from the vote, withholding its six votes after the haredi faction failed to reach an agreement with Liberman regarding another piece of legislation proposed by the Shas party. Earlier on Wednesday, Liberman stormed out of a meeting with UTJ leaders after the haredi faction demanded that the Defense Minister back the "Supermarket Law", which would enable the Interior Minister to nullify local bylaws permitting the opening of businesses on the Sabbath. 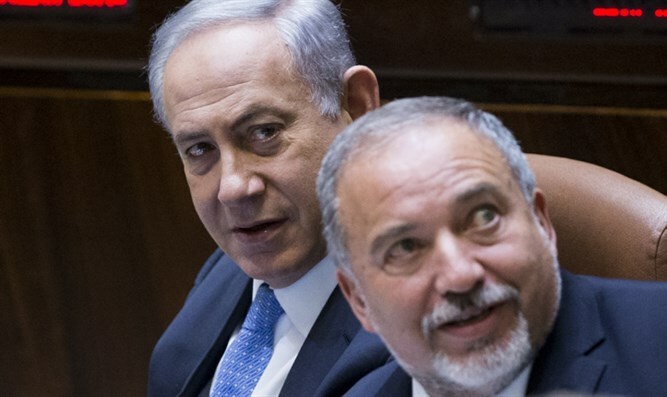 Liberman has expressed his opposition to the law, calling it ‘religious coercion’. After the Defense Minister failed to agree to drop his opposition to the proposal, haredi MKs warned they would be unable to support his proposal to reduce the requirements for imposing the death penalty on terrorists, saying that they would have to consult the party’s spiritual leaders for guidance on the issue. If it passes its first, second and third readings, the law would allow army courts to sentence terrorists found guilty of murder to death with only a simple majority. Under current law, the death penalty may only be imposed by unanimous decision. The law would also permit state criminal courts to impose the death penalty under the same conditions. Israel has not used the death penalty since the 1962 execution of SS officer Adolf Eichmann.